Chairman Samson, board members, thank you again for the opportunity to speak on leveraging the upcoming decade of construction to expand access on the George Washington Bridge. The benefits of a robust facility vastly outweigh the cost. Sustain growth in an annual billion dollars of regional cycle tourism. Directly offset the CO2 emissions of hundreds of thousands of cars. Strengthen regional resilience to weather or man-made disaster. Broadly enhance affordability, health benefits and competitiveness that would flow from connecting a robust and expanding regional bike grid. I would add the opportunity to correct a fatal flaw in the Bridge’s design. 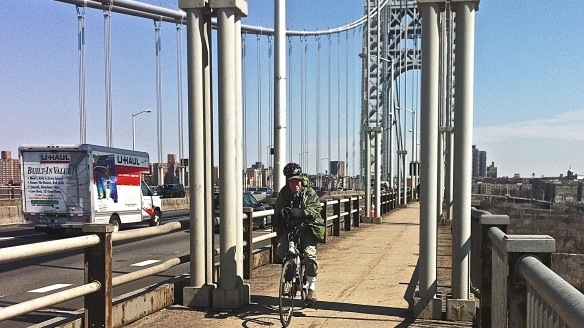 The first photo is the George Washington Bridge. 7′ wide path. Guard rails just over 4 feet high. No wind protection. The cyclist that day was subject to gusts of 30 miles per hour. 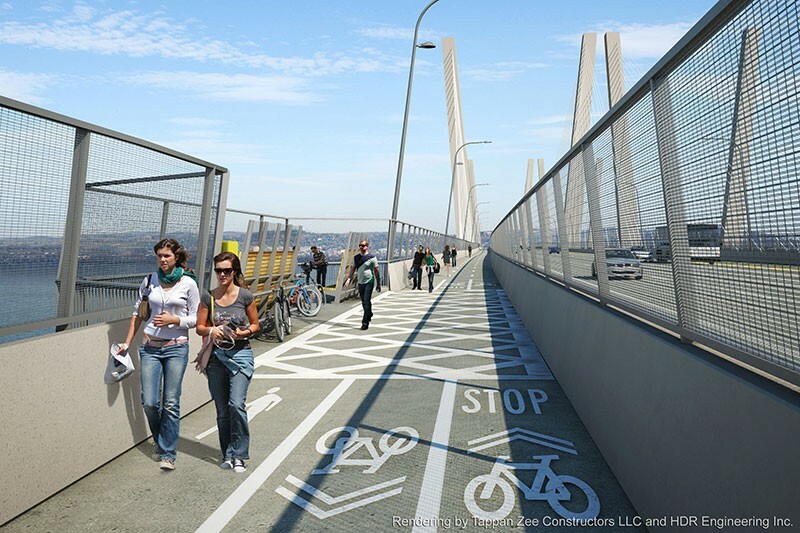 The next photo is the proposed path for the New Tappan Zee. 12′ wide. Barriers well over head height with mesh is fine enough to see through, yet dense enough to minimize wind gusts. Critically, the barriers are non-climbable, they deny the finger and footholds needed to ladder oneself over. Proposed path for New Tappan Zee. Image by NYS Thruway Authority. Leading mental health advocates including Harvard School of Public Health, the Glendon Association, the National Suicide Prevention Lifeline and Mental Health Association of NYC all reach the same conclusion: Means matter. Deny them and you save lives. And installation of physical barriers at high risk sites have repeatedly been shown to be the most effective deterrent. Example. 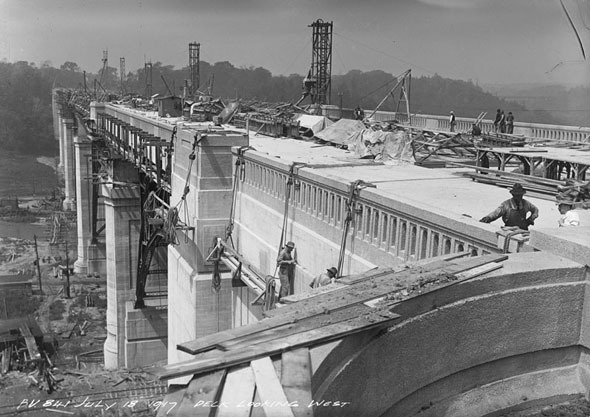 Toronto’s Prince Edward Viaduct had been the scene of some 500 fatalities since it opened in 1918. For years, it was the world’s second most fatal standing structure, behind the Golden Gate. 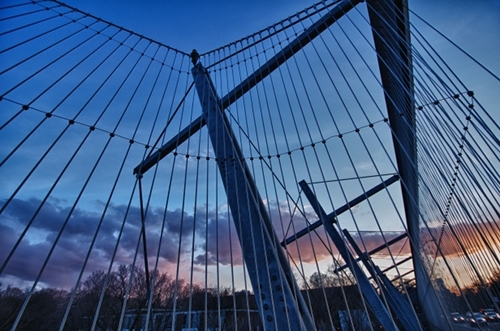 In 2003 the city added a safety barrier, which it termed a luminous veil. There have been no recorded deaths on the Viaduct since. To paraphrase the NY Times, by integrating a “veil of deterrence” into the design of a widened Path, the Authority will not only engender the region with the economic, environmental and resiliency benefits, it will also realize a once-in-a-lifespan opportunity to forever mitigate the Bridge’s dark side. Cyclist’s Proposal. Rendering by Joseph Lertola. 2017/12 – What Would Othmar Do?